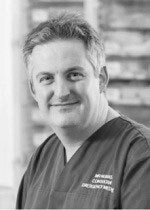 Mr Baker qualified from Southampton Medical School in 1999 and undertook basic surgical training and became a member of the Royal College of Surgeons in 2004. He was appointed a Specialist Registrar on the Wessex Emergency Medicine rotation gaining experience in Southampton, Portsmouth and Basingstoke. In 2009 he was appointed as a Consultant in Emergency Medicine at the Royal Bournemouth Hospital. In parallel to this he studied at Bath University and gained the Diploma in Sports Medicine with Merit. Mr Baker is involved on a daily basis in the management of all emergency conditions including a wide spectrum of sports injuries. In addition to this, he works on the Dorset Air Ambulance and is a Rugby team Doctor with experience at both local and national level. Having completed the Edinburgh marathon Mr Baker continues to run half marathons both locally and further afield. He enjoys most sports, particularly rugby, badminton and previously achieved a high level in martial arts. He has experience both training and instructing in the gym. Mr Baker has published articles in Emergency Medicine and presented at national conferences. He is both a peer reviewer and member of the reviewer advisory group for the Emergency Medicine Journal. Mr Matthew Baker does not hold a share or financial interest in this hospital, another Nuffield Health hospital or the company. Mr Matthew Baker does not have a share or financial interest in equipment used at this hospital or another Nuffield Health hospital. Mr Matthew Baker does not hold any paid advisory role(s) at this hospital or on behalf of Nuffield Health.